This article is about the city of Bunbury. For the local government area, see City of Bunbury. For the CBD / suburb, see Bunbury, Western Australia (suburb). Bunbury is a coastal city in Western Australia, approximately 175 kilometres (109 mi) south of the state capital, Perth. It is the state's third-largest city, with a population just behind that of Mandurah. Located at the south of the Leschenault Estuary, Bunbury was established in 1836 on the orders of Governor James Stirling, and named in honour of its founder, Lieutenant (at the time) Henry Bunbury. A port was constructed on the existing natural harbour soon after, and eventually became the main port for the wider South West region. Further economic growth was fuelled by completion of the South Western Railway in 1893, which linked Bunbury with Perth. Greater Bunbury includes four local government areas (the City of Bunbury and the shires of Capel, Dardanup, and Harvey), and extends between Yarloop in the north, Boyanup to the south and Capel to the southwest. The original inhabitants of Greater Bunbury are the Indigenous Australian Noongar people. The people hunted and fished throughout the sub-region prior to the first European settlement in the 1830s. The first registered sighting of Greater Bunbury was by French explorer Captain Louis de Freycinet from his ship the Casuarina in 1803. He named the area Port Leschenault after the expedition's botanist, Leschenault de La Tour. The bay on Greater Bunbury's western shores was named Geographe after another ship in the fleet. In 1829, Dr Alexander Collie and Lieutenant Preston explored the area of Bunbury on land. In 1830 Lieutenant Governor Sir James Stirling visited the area and a military post was subsequently established; it only lasted six months. The area was renamed Bunbury by the Governor in recognition of Lieutenant Henry William St Pierre Bunbury, who developed the very difficult inland route from Pinjarra to Bunbury. Bunbury’s first settlers were John and Helen Scott, theirs sons Robert, William and John Jr, and step-son Daniel McGregor, who arrived in January 1838. Bunbury township was mentioned in the Government Gazette in 1839, but lots in the township were not surveyed until 1841. In March 1841 lots were declared open for selection. Intermittant bay whaling activity was conducted on the coast from the 1830s through to the 1850s. By 1842 Bunbury was home to 16 buildings including an inn. Thereafter, a growing port serviced the settlers and the subsequent local industries that developed. One of the major industries to open up to cement the importance of Bunbury as a port was the timber industry. Timber logs would be floated down the Collie River to be loaded aboard ships headed to the Northern Hemisphere or to South Africa where the hardwood timbers were used for railway sleepers. In 1884 the Government decided to construct a railway from Bunbury to Boyanup, 16 miles (26 km) long. When the line was completed in 1887, the contractor who had built it obtained a contract to control and work it, which he did with horses. The line was eventually taken over by the Government in 1891 and operated with locomotives. The inconvenience of a railway isolated from the capital gave rise to agitation and in 1893 the South Western Railway was constructed between East Perth and Picton, connecting Greater Bunbury and Perth. The Boyanup line was extended to Donnybrook in the same year. The railways connected the port of Bunbury to the coal and mineral deposits and agricultural areas to the north and east of Greater Bunbury. The population of the town was 2,970 (1,700 males and 1,270 females) in 1898. In 1903 a breakwater to further protect the bay and port area was completed. The Old Bunbury railway station served as the terminal for the Australind passenger train between Perth, transporting its first passengers on 24 November 1947. The last train to use the station departed on 28 May 1985 with a new station opening at East Bunbury, 4 kilometres (2 mi) to the south-east the following day. The railway land was then sold and Blair Street realigned. Bunbury is situated 175 kilometres south of Perth, at the original mouth of the Preston River and near the mouth of the Collie River at the southern end of the Leschenault Inlet, which opens to Koombana Bay and the larger Geographe Bay which extends southwards to Cape Naturaliste. Bunbury has a Mediterranean climate (Köppen classification Csa) with warm summers and cool winters. In 2007 Bunbury was recognised as Australia's fastest growing city for the 2005/06 period by the Australian Bureau of Statistics. At June 2015 the estimated urban population of Bunbury was 75,628. At the 2011 Census the median age was 36. It is estimated that by 2031 the population of the Greater Bunbury region will exceed 100,000 people. In Bunbury (Significant Urban Areas), 74.0% of people were born in Australia. The most common other countries of birth were England 6.3%, New Zealand 3.4%, South Africa 1.8%, Scotland 0.8% and Philippines 0.7%. 88.1% of people only spoke English at home. Other languages spoken at home included Italian 1.0%, Afrikaans 0.8%, Tagalog 0.3%, Filipino 0.3% and Mandarin 0.2%. In the 2011 Census the most common responses for religion in Bunbury (Significant Urban Areas) were No religion 27.2%, Anglican 22.7%, Catholic 22.2%, Uniting Church 3.7% and Christian, nfd 3.3%. The most common occupations in Bunbury (Significant Urban Areas) included Technicians and Trades Workers 20.4%, Professionals 15.0%, Clerical and Administrative Workers 12.9%, and Labourers 12.5%. In 2011 Bunbury had an unemployment rate of 4.9%. The Greater Bunbury sub-region comprises the four local government areas of the City of Bunbury, Shire of Capel, Shire of Dardanup and Shire of Harvey. The Greater Bunbury Region Scheme, in operation since November 2007, provides the legal basis for planning in the Greater Bunbury sub-region. The Greater Bunbury sub-region is administered by State and local governments. There is no sub-region government structure in place for Greater Bunbury. In December 2013 the Western Australian Planning Commission published the Greater Bunbury Strategy to guide urban, industrial and regional land use planning; and associated infrastructure delivery in the Greater Bunbury sub-region in the short, medium and long terms. The Strategy provides for the growth of Greater Bunbury through infill development of existing urban areas and the development of greenfield land in Waterloo east of Eaton, to provide for a population of 150,000 people beyond 2050. The economy of Bunbury is diverse, reflecting the range of heavy and general industries in the locality, mining, agricultural landscapes, services for the growing population, key transport links and the influence of Perth. The mining and mineral processing sector remains the main economic driver for Bunbury ($2 billion annual turnover). The agriculture sector however, remains vitally important as the value of production is approximately $146 million per annum (2005/06) which equates to approximately 30 per cent of the South West region’s agricultural production. Other industries that are vital to the economic well-being of Greater Bunbury include retail and service industries, building industry, timber production and tourism. The Bunbury Port will continue to be the centre of economic activity for the Greater Bunbury sub-region with the flow of goods through it to and from all parts of the world. The proposed expansion of the port, as identified in the Bunbury Port Inner Harbour Structure Plan, will promote further economic growth for the sub-region, and may in time be an economic stimulus for the corporate support and ancillary services associated with port-based industries locating to Bunbury city centre, further strengthening its role as a regional city. South Regional TAFE is a State Training Provider providing a range of vocational education with campuses in Bunbury, Albany, and other locations in the southern Western Australia region. Edith Cowan University also has a campus based in Bunbury. 6EL 621 kHz AM – Easy listening format. Different from its Easy Listening Network partners in the Eastern states. Has local advertising. Part of Spirit Radio Network. ABC South West WA (6BS): 684 kHz AM – News, talk and sport. Broadcasts breakfast and morning programs from Bunbury. GWN7 had its origins in Bunbury as BTW-3 in the late 1960s and then purchased other stations in Kalgoorlie and Geraldton, as well as launching a satellite service in 1986 to form the current network. GWN7's studios and offices are based at Roberts Crescent in Bunbury, with its transmitter located at Mount Lennard approximately 25 km to the east. The station produces a nightly 30-minute news program for regional WA at 5:30pm on weeknights. WIN Television maintains a newsroom in the city; however, the station itself is based in Perth. The WIN newsroom provides regional coverage for sister station NEW-10's TEN Eyewitness News bulletins at 5pm each night, which are simulcast on WIN. On 28 July 2011, new digital television services from GWN and WIN commenced transmission. A new stand alone Network Ten affiliated channel branded as Ten West was the first of the new digital only channels to go on-air. The other new digital only channels that are also now available in Bunbury include 7Two, 7mate, ishop tv, RACING.COM, WIN HD, 10 Bold, 10 Peach, Sky News on WIN, TVSN, Gold, 9Gem and 9Go!. Subscription Television service Foxtel is available via satellite. Bunbury Herald, South Western Times and Bunbury Mail are local newspapers available in Bunbury and surrounding region. The Bunbury Historical Society is located in the historic King Cottage, which was built around 1880. In 1966 the cottage was purchased by the City of Bunbury and subsequently leased to the Society. The rooms of the cottage are furnished and artifacts displayed to reflect the way of life for a family in Bunbury in the period from the 1880s to the 1920s. It is also very close to the Ferguson Valley. There are a number of sporting clubs in Greater Bunbury. Bunbury Dynamos, Bunbury United and Hay Park United all play in the Bunbury area in the South West Soccer Association (SWSA). With the matches contested between the three sides always a competitive affair. Bunbury Dynamos are the current Premier League and Second Division Champions. With the latter also winning the SWSA Second Division Cup in the same year. Bunbury Airport services Greater Bunbury and is located 8 kilometres (5 mi) southeast of the city centre. TransWA provides rail and coach services from Bunbury Terminal: Australind train, GS3, SW1 and SW2 to Bunbury and services south from Bunbury and South West Coach Lines provides coach services to and from Bunbury. Bus services in Greater Bunbury are run by TransBunbury with 10 routes. Bussell Highway links to Busselton, Western Australia to the west. The Eelup Rotary, where Forrest Highway terminates in East Bunbury, was named by the Royal Automobile Club of Western Australia as the worst regional intersection in Western Australia and has since undergone a $16m upgrade, which included eight sets of traffic lights (which were switched on in the early hours of Monday 21 May 2012) and extra lanes for each entrance. The government was criticised for breaking a 2008 election promise to build an overpass and underpass. 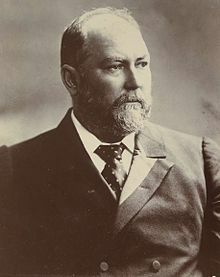 John Forrest was an explorer, surveyor and the first Premier of Western Australia. On 6 February 1918, Forrest was informed that he was to be raised to the British peerage as "Baron Forrest of Bunbury in the Commonwealth of Australia". Despite the announcement, however, no letters patent were issued before his death, so the peerage was not officially created. John Boyle O'Reilly, Irish-born poet, sent to Bunbury in February, 1868 as a convict, escaped on an American whaling ship in 1869. 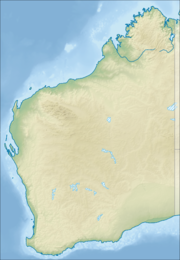 Wikimedia Commons has media related to Bunbury, Western Australia. ^ "2011 Census Community Profiles: Bunbury". ABS Census. Australian Bureau of Statistics. Retrieved 15 September 2016. ^ a b c d e "Bunbury History". Retrieved 12 April 2016. ^ a b asprott. "Town names". www0.landgate.wa.gov.au. Retrieved 2015-12-01. ^ Cammilleri, Cara (1966). 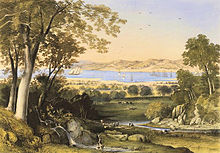 "Bunbury, Henry William St Pierre (1812–1875)". Australian Dictionary of Biography. 1. Canberra: Australian National University. Retrieved 24 December 2014. ^ "Founding family memorial to relocate". 9 March 2017. ^ Martin Gibbs, The shore whalers of Western Australia; historical archaeology of a maritime frontier, Sydney University Press, Sydney, 2010, p.130-1. ^ Gibson, Alex J; du Pleiss, D H C (December 1947). Report of the Royal Commission appointed to inquire into the Management, Workings and Control of the Western Australian Government Railways (without Graphs), Presented to both Houses of Parliament, Second Session of the Nineteenth Parliament (PDF) (Report). Government Printer. Retrieved 28 March 2016. ^ "POPULATION OF WESTERN AUSTRALIA". Western Mail. Perth. 22 April 1898. p. 23. Retrieved 28 May 2012 – via National Library of Australia. ^ "The Australind - Fast Day Train to Bunbury". Kalgoorlie Miner. 26 November 1947. p. 1. Retrieved 10 July 2014. ^ "Greater Bunbury Strategy" (PDF). Government of Western Australia. Retrieved 19 February 2015. ^ "Climate statistics for Bunbury". Australian Bureau of Meteorology. ^ "3218.0 Regional Population Growth, Australia". Australian Beureau of Statistics. 27 February 2007. ^ a b c d Australian Bureau of Statistics (31 October 2012). "Bunbury". 2011 Census QuickStats. ^ a b "Greater Bunbury Region Scheme". Western Australian Planning Commission. Retrieved 11 April 2016. ^ Western Australian Planning Commission (December 2015). Greater Bunbury Strategy (Report). Retrieved 11 April 2016. ^ a b c Western Australian Planning Commission (2011). Draft Greater Bunbury Strategy (section 4.6) (PDF) (Report). Retrieved 11 April 2016. ^ "Regional WA ready to switch on new multichannels". tvtonight.com.au. 6 July 2011. Retrieved 19 April 2017. ^ "Bunbury Historical Society, King Cottage Museum". Bunbury Historical Society. Retrieved 21 November 2008. ^ "Roundabout lights a 'bandaid' fix". ABC Online. 22 May 2012. Retrieved 30 October 2014. ^ "Liberals make $500m Bunbury election pledge". ABC Online. 21 August 2008. Retrieved 30 October 2014. ^ F. K. Crowley (1981). "Forrest, Sir John [Baron Forrest] (1847–1918)". Australian Dictionary of Biography. Canberra: Australian National University. Retrieved 20 November 2008. ^ "Essendon Football club – Leon Baker Profile". 2008. Archived from the original on 4 August 2008. Retrieved 3 June 2008. ^ Genine Unsworth, ABC South West WA, "Export: Paul Barnard", 12 June 2002. Accessed 2 October 2007. ^ "Australians at the 1996 Atlanta Paralympics: Swimmers". Australian Sports Commission. Archived from the original on 20 January 2000. Retrieved 18 May 2014. ^ Pope, Brian (2005). "Cuper, Mary Ellen (1847–1877)". Australian Dictionary of Biography. Australian Dictionary of Biography, Supplementary Volume. Retrieved 30 March 2015. ^ Bainger, Fleur. "Bunbury girl scores Mad Max part". Retrieved 24 February 2013. ^ Bolton, Geoffrey Curgenven (1981). "Forrest, Alexander (1849–1901)". Australian Dictionary of Biography. G. C. Bolton. Retrieved 30 March 2015. ^ John Ward, Cricinfo, "Murray Goodwin – a short biography", 20 September 1999. Accessed 2 October 2007. ^ "West Coast Eagles Football club – Player Profile – Adam Hunter". 2008. Retrieved 3 June 2008. ^ a b Staples, A. C. "Rose, Edwin (1863–1948)". Australian Dictionary of Biography. ANU. Retrieved 30 March 2015. ^ Bolton, G.C. "Sholl, Richard Adolphus (1847–1919)". Australian Dictionary of Biography. ADB. Retrieved 30 March 2015. ^ Bolton, Geoffrey Curgenven (1988). "Sholl, Robert Frederick (1848–1909)". Australian Dictionary of Biography. Australian Dictionary of Biography, Volume 11. Retrieved 30 March 2015. ^ Bolton, G.C. "Sholl, Robert Frederick (1848–1909)". Australian Dictionary of Biography. ANU. Retrieved 30 March 2015. ^ "Australians at the 1996 Atlanta Paralympics: Athletes". Australian Sports Commission. Archived from the original on 20 January 2000. Retrieved 18 May 2014. ^ "Shani Waugh - European Tour - Golf - Yahoo Sports". Retrieved 6 January 2016.